"Private Investigator Nikki James grew up on the tough streets of Lyndhurst and believes there's nothing left to surprise her. All that changes the night she follows teenager Monica Trevgard into the shadows-and becomes a pawn caught in a war between two very different men. One fills her mind with his madness, the other pushes his way into her life-and her heart. Nikki knows how dangerous love can be, but if she wants to survive, she must place her trust in a man who could easily destroy her. Michael Kelly has come to Lyndhurst determined to end the war between himself and another brother of the night. For 300 years he has existed in life's shadows, gradually learning to control the life from death cravings of a vampire. Nikki not only breaches his formidable barriers with her psychic abilities, but makes Michael believe he may finally have found a woman strong enough to walk by his side and ease the loneliness in his heart. But will his love be enough to protect her from a madman hell-bent on revenge? Or will it drive her into his enemy's deadly trap? 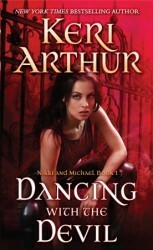 Dancing with the Devil is an urban paranormal the intertwines Vampires, Zombies, and Psychics. Nikki, a private investigator finds herself in the company of Michael, her protector and vampire; together they must find a way to defeat the nefarious Jasper and stop his massive killing spree. With their psychic connection growing stronger, will Nikki and Michael be able to work together efficiently, or will their personal issues and lack of trust of each other get in the way? I originally found the idea of combining something as abnormal as psychics, with the paranormality of vampires and zombies, fun. The beginning is great in really placing you right in the action, while getting some background info, so the book was fairly easy to follow. I liked Nikki’s character (especially with her being a private investigator) and the issues she had to work through with her past, but after a while, it got kind of irritating how she just kept bringing her control issue with Tommy up and using it as a crutch. The ending gives hope to her finally getting over this. Michael, although brusque and somewhat used to getting his way, is softened by Nikki and becomes used to her tenacity in finishing her case. Both of these characters are great, I think, in helping each other, not just in their quest, but in healing character flaws as well. The overall mystery/case was okay, if not predictable. I would have liked the aspect of Jasper’s crimes to lead to some greater scale of upheaval, maybe to span throughout other books. This could have been something to use as a focus for the book series. I liked the author’s writing style, and her use of descriptive action scenes, which really made the book great. In all, I think this is a good start to the series, with an interesting concept of psychic vampires, and I’m sure the next books in the Nikki & Michael series are promising as well. I would recommend this to those who love a cozy, yet action packed urban paranormal read.